To send a human to Mars via conventional chemical engines means a journey of at least 6 months. However, there is a way to make it only 1 month. In the race to send humans to Mars, the use of conventional chemical rocket engines means that the journey time would take a minimum of six months each way. However, there is a solution that could cut that down to about a month: nuclear fission propulsion. A nuclear reactor produces enough energy to propel a craft almost six times faster than chemical rocket engines. And because the energy density of nuclear fuel is far greater than the equivalent mass of chemical fuel, less physical fuel is needed. "Fission power has ten million times the energy per kilogram as chemical systems," says James Werner, project leader of the Fission Surface Power Technology project at Idaho National Laboratory. Thus, a spacecraft could be lighter, with more room for food, supplies and equipment. The difference in the amount of heat that is generated by the different fuels is responsible for the difference in speed. The heat released by chemical engines in the reaction between hydrogen and oxygen fuel raises combustion gases to a maximum temperature of 4,000 Kelvin (over 3,700°C). These hot gases are then accelerated through a nozzle, converting thermal energy into kinetic energy, or thrust. In contrast, in nuclear thermal rockets (NTRs), the source of thermal energy and propellant are separated. In a nuclear reaction, neutrons spilt fissile isotopes, such as uranium, consequently releasing thermal energy, gamma rays and extra neutrons, keeping the engine running. The energy released is also used to heat up the propellant, such as hydrogen, and accelerate it up to 20,000 Kelvin (over 19,700°C), four times hotter than our sun's surface. NERVA solid core nuclear propulsion system. Image courtesy NASA. Click to enlarge. Specific impulse (Isp) is used to calculate the performance of rocket engines. Think of it as the 'miles per gallon' of spacecraft. Chemical rockets have a maximum Isp of 500 seconds, with an exhaust velocity of 4,900 meters per second (m/s). Nuclear rockets can have Isp's of up to 6,000 seconds. A nuclear fission engine with 1,000 Isp will produce twice the speed of exhausted gases: 9,800 m/s. This is not the same as the spacecraft's velocity, which depends on its mass, shape, etc. But, "what really counts are the initial acceleration and the rate at which that acceleration changes when the engines are turned off in space" says Carlos Maidana, a CERN nuclear scientist. Under the U.S. NERVA program, nuclear engines were tested that could get humans to Mars and back in 80 days. But the program was cancelled due to lack of public interest. That was in the 1970s. Today, Russia is investing millions of dollars to create a Mars-bound nuclear rocket that will be ready in 2018. Conventional chemical engines are still needed to launch the ship into space, after which the nuclear engines would be switched on. However, this does carry risks. Steven Howe, Director of the Center for Space Nuclear Research, says that the NTR is launched "cold," meaning that there are no radioactive products created initially, as the engines will only be started in high Earth orbit. The only radioactive material will be the small amount of fuel onboard. Howe maintains that an NTR poses no threat to the biosphere in case of a launch abort. Also, "there is no threat of explosion in NTRs, e.g. the shuttle disasters, because there is no oxygen tank to react with the hydrogen propellant." Calculations will need to be made to ensure that if there is a crash, the ship falls into a remote uninhabited area. Opponents counter that while there might not be an atomic-bomb style explosion of the actual nuclear fissile material itself, a rocket's fuel could explode in the launch phase and shower the planet with its radioactive payload, much like a conventional explosive device laced with radioactive materials can become a "dirty bomb." Such a 'Chernobyl in space' would spread radiation everywhere; in 1978, a Russian nuclear-powered satellite, Kosmos 954, did crash in Northern Canada. Consequently, Russia paid millions of dollars in reparations. Proponents of the program counter that chemical disasters are no less devastating. In October 2010, about one million cubic meters (35 million cubic feet), of toxic red slime escaped from an aluminum manufacturing plant in Hungary. Described as an "ecological disaster," 100 miles of area was contaminated. 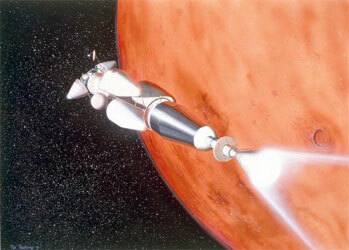 Artist's impression of a Mars nuclear thermal rocket entering orbit around Mars. Image courtesy Carlos Maindana. Unsurprisingly, the computer requirements of NTRs are very complex. It requires research into nuclear materials, stress analysis, thermal and heat transfer, fluid dynamics, radiation physics and control systems, to name a few. These are studied under one umbrella term: multi-physics and analysis, using parallel computing such as grids. However, even though computing power has increased, more accurate and complex mathematical models are needed. This requires additional researchers and experiments to improve the field. George Schmidt, Deputy Director of NASA's Glenn Research Center and Technology Directorate says: "It would be wonderful to also get some in the world's high-energy physics community engaged in this effort." New jobs, economic stimulation, technology spin-offs and human inspiration are a handful of benefits from fission propulsion research. "Political support, more funding and international collaboration is needed," says Maidana. By managing the risks, which are indeed hazardous, we could be propelled into a future where the journey time to the Red Planet is the same as a luxury cruise from the UK to Australia.